My name is Andrew Adam and I am an Eagle Scout from Troop 88 in Mechanicsburg, PA. Currently, I am a sophomore at Cumberland Valley High School where I am a cadet with the JROTC Screaming Eagles Battalion. In addition, I am a member of the United States Volunteers (USV), a civil war re-enacting unit, where I portray a Union drummer. One of the main requirements to achieve the rank of Eagle Scout is to successfully plan, lead and execute a service project that benefits the community. I have chosen to focus my project on Unity in America and the Civil War. For my project, I am developing “Unity Park”, a park designed to educate visitors on the many aspects of the American civil war. The centerpiece of the park will feature a bronze statue, dedicated to musicians and the many young people who served our country in the war. Almost one fifth of both the Confederate and Union armies were under the age of 18, and many of them served as musicians. There is no monument specifically dedicated to musicians or to the many young people that served our country during this war. It is my hope that this project will encourage young people today to become involved in America. It is also my hope that Unity Park will serve as a lasting reminder of unity, then and now, and how important it is for us to work together towards unity in our country. It seemed fitting to construct Unity Park in the town where our country almost divided. I am pleased to announce that Unity Park will be located in downtown Gettysburg, Pennsylvania on a plot of land owned by the beneficiary of my project, the Gettysburg Area School District. 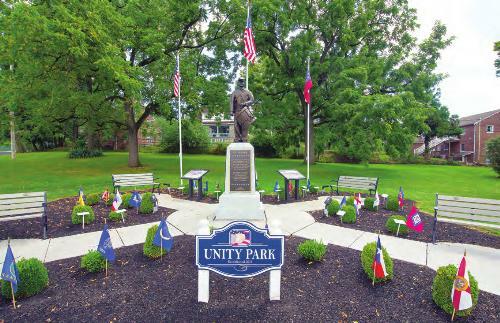 Unity Park was unveiled on July 5th, 2015 to honor the 150th anniversary of the end of the civil war and to celebrate unity and peace in America. One of the most rewarding parts of this project has been interacting with the many people that I have met along the way. There are many individuals and organizations that have donated their time, effort, expertise and financial contributions to my project and I am grateful to have met and have the opportunity to work with each and every one of them. On Sunday 24 February 2013 at the Troop 88 Court of Honor, the Pioneer District Commissioner, Mr. Art Williams, convened a special BSA National Court of Honor to award Eagle Scout Garrett G. Long the Boy Scouts of America Medal of Merit. 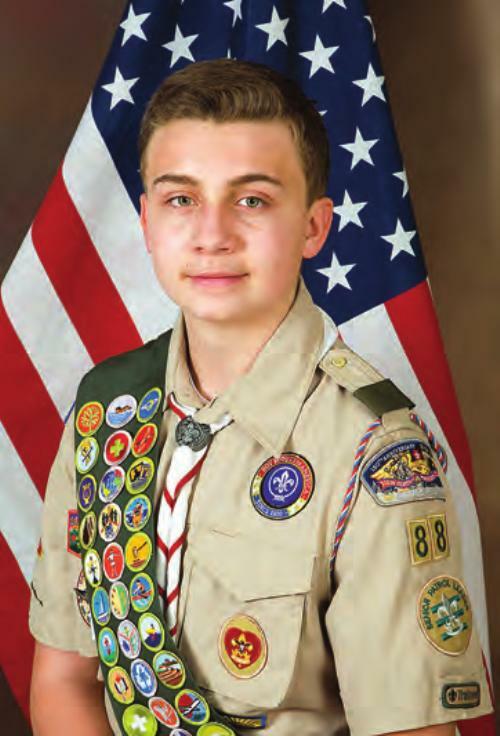 Eagle Scout Garrett Long, 17, demonstrated an outstanding act of service when in May of 2012 while waiting to order food at the McDonalds along Route 114 in Silver Spring Township on a Saturday night, he heard a desperate cry for help. A man said his girlfriend was unconscious in the woman's restroom, her face was blue and she wasn't breathing. Garrett, an Eagle Scout in Troop 88 Mechanicsburg and lifeguard trained in CPR, took action. He said he worked for nearly 10 minutes to revive the woman. Ultimately, he was successful. "She just gasps for air and she came back and right at that moment the paramedics busted through the door and took over from there," Garrett said. "They told me if I didn't get there the time I did, and did what I did, she would have been long dead before they arrived." CONGRATULATIONS to Eagle Scout Garrett G. Long, Troop 88 Mechanicsburg, PA.
At its meeting on July 20 at Camp Tuckahoe, the Council Executive Board overwhelmingly selected “New Birth of Freedom” as the name for the newly-formed council. Since the merger of the former Keystone Area and York-Adams Area Councils on April 1, work to select an appropriate name that would be meaningful and represent all parts of the council area have been ongoing. In the end, the prominent role that our area has played in the history of the United States and President Lincoln’s Gettysburg Address were the driving influences behind the selection of the new name. New council shoulder patches depicting the council’s new name should be available in a few weeks at both the Mechanicsburg and York service centers. An announcement will be posted on the New Birth of Freedom Council website when the new shoulder patches have arrived. The New Birth of Freedom Council coordinates Scouting programs for youth in Adams, Cumberland, Dauphin, Franklin, Perry and York Counties. New Birth of Freedom Council.doc More information about the newly named "New Birth of Freedom Council"